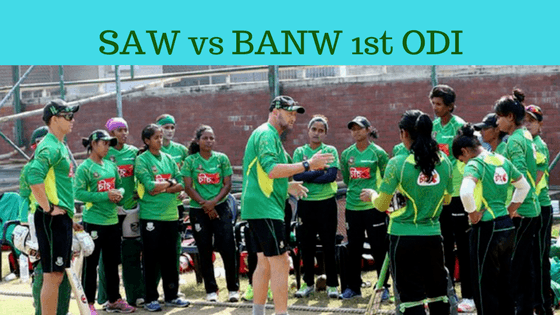 Find out who will win the match between Bangladesh Women vs South Africa Women? In Today’s Dream11 Fantasy Cricket Match Prediction– SAW vs BANW 1st ODI, we will cover playing 11, pitch report of Senwes Park, Potchefstroom, toss prediction. We will also cover players recent and past performance, key players, weather report of Potchefstroom, all the latest news and updates of SAW vs BANW, the best choice for captain and vice-captain, dream11 guru prediction, where to watch the live match and details of live streaming. You may like to read IPL 2018 Predictions. All the details that we provide are taken from 100% reliable sources so make sure to read the complete post to get the maximum benefit. The details that we provide are absolutely FREE and you don’t have to pay a single penny. You just need to invest your five minutes s that you don’t miss any details. Where Can You Watch the Live Streaming of BANW vs RSAW, 1st ODI or Channels to Watch? Date: The match will be played on 4t May 2018(Friday). Match: Bangladesh Women tour of South Africa, 2018, SA-W vs BD-W, 1st ODI. Time: 08:00 AM GMT, 01:30 PM IST. In 2008 the name of North West Cricket Stadium was changed to Senwes Park. the pitch will favour the batsmen. The batsmen can easily trust on the pace and bounce of the ball and can play on the rise shots. As the game progresses it will start favouring the spin bowlers. Bangladesh Women is a weak team and after 14 months they are travelling away from home to play ODI. In last 12 matches, BANW won only 2 matches and RSAW won 10 matches. The stats clearly show shows that how difficult it’s going to for Bangladeshi Girls. On 4th May Friday, it will be a sunny day. The sun will be out throughout the day. The minimum temperature is expected to be 7-Degree Celsius and the maximum to be 22-Degree Celsius. The humidity is expected to be 43% which may go down to 18%. People of South Africa can watch the 1st ODI of Bangladesh Women vs South Africa Women on SuperSports. Fans can also watch on SuperSports digital platforms for example on their Website or App. Andrie Steyn, Lizelle Lee(w), Zintle Mali, Mignon du Preez, Shabnim Ismail, Laura Wolvaardt, Chloe Tryon, Dane van Niekerk(c), Ayabonga Khaka, Marizanne Kapp, Raisibe Ntozakhe, Sune Luus, Trisha Chetty, Masabata Klaas. Nigar Sultana (wk), Shamima Sultana, Rumana Ahmed (c), Fahima Khatun, Suraiya Azmin, Fargana Hoque, Sharmin Sultana, Sanjida Islam, Panna Ghosh, Jannatul Ferdus, Khadija Tul Kubra, Jahanara Alam, Salma Khatun, Nahida Akter. After a gap of 14 months, Bangladesh Women will play outside their country. Last time South Women Toured Bangladesh, BD-W lost 4 matches out of 5 games. It will be interesting to see how Bangladeshi take on this opportunity in today’s match. Except for spin, Bangladeshi lacks in all the department. Captain Rumana Ahmed has to play an important role in today’s match. Khadija Tul Kubra has to lead the bowling if they want to defeat SA-W.
Nigar Sultana (wk), Rumana Ahmed (c), Fargana Hoque, Sharmin Sultana, Panna Ghosh, Jahanara Alam, Jahanara Alam, Salma Khatun, Nahida Akter, Sanjida Islam, Jannatul Ferdus. This year SA-W lost an ODI series and a T20I series IND-W and they will be desperate to win this series. It will be interesting to see how they make their playing 11. According to our prediction, Andrie Steyn will get chance over Trisha Chetty. Lizelle Lee(w), Mignon du Preez, Laura Wolvaardt, Chloe Tryon, Dane van Niekerk(c), Ayabonga Khaka, Marizanne Kapp, Sune Luus, Shabnim Ismail, Masabata Klaas, Trisha Chetty/Andrie Steyn. Pro tips: You can select Lizelle Lee over Nigar Sultana as she is a top order batsman and has performed consistently. Pro tips: The above players are most likely to perform. Try to select from the above list. Make a combination of players for multiple teams. Pro tips: Lizelle Lee is the best option for a captain. You can take anyone as a vice-captain. Conclusion: This is it for Today’s Dream11 Fantasy Cricket Match Prediction of SA-W vs BD-W, 1st ODI, which will be played on Friday 4th May. You can give your valuable feedback in the comment section. Subscribe to our notification of latest updates. GOODBYE!